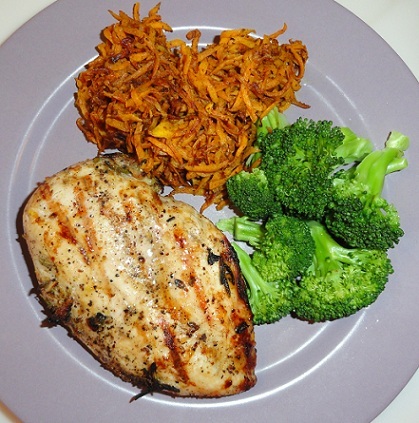 Paleo Grilled Lemon Garlic Chicken — My FAVORITE Chicken Marinade | Real. Fresh. Paleo. There is this middle-eastern restaurant near me that makes a fabulous chicken shwarma dish with whole grilled chicken breasts. The chicken is always super juicy and has such a great flavor with a hint of lemon and garlic. I halfheartedly tried to copy it once or twice, but didn’t have much success. A few weeks ago I stumbled across a yogurt based lemon and garlic marinade that sounded promising. I omitted the yogurt to make it paleo friendly, and changed some of the seasonings around to suit my tastes a bit more. The result was something pretty fabulous (if I do say so myself). It was actually pretty close to the restaurant chicken, but even better! I let my chicken sit in the marinade for 24 hours. You could possibly do less, but the salt in the marinade brines the chicken, making it super moist and helping draw the flavors into the chicken. If you are going to try for a shorter time, I’d give it at least several hours. If you have the time, do yourself a favor and let it sit all night. There is nothing remotely subtle about the resulting flavors here. The lemon takes center stage and the resulting flavor is bright and bold and the fresh ground black pepper gives it a little kick. Perfect for summertime! A teaspoon of salt sounds like a lot, but it doesn’t come out overly salty and the salt brines the chicken to perfection. 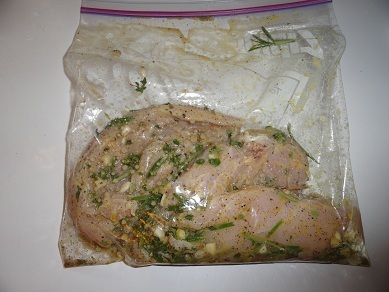 Add dry marinade ingredients to a gallon size zip lock bag (or lidded Tupperware container) and then add the wet ones. Squish them around to mix up a bit and add chicken. Seal bag and squish bag (or shake container) to thoroughly cover chicken. Chuck it in the refrigerator and forget about it for 24 hours — Unless you are the overly attentive type, then you can go shake, flip, or squish your chicken a couple of times while waiting. I just let mine sit and it came out fine. Pre-heat grill on high for about 10 minutes (or until hot). Reduce heat to medium. Using tongs, place chicken on grill (using a fork will poke holes in the meat and let some of the juices out, making drier chicken). Let sit 5 minutes. 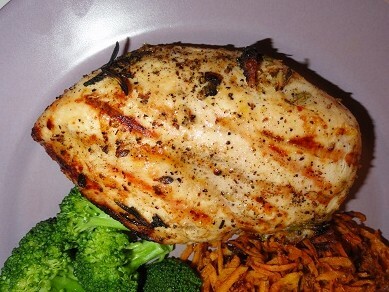 Flip chicken breasts with tongs and cook an additional 5 minutes. Smaller thinner breasts should be done at this point. The larger breasts stayed on the grill and cooked for an additional 3 minutes per side. Check chicken with a meat thermometer or slice into the thickest part of the breast and see if its done. I served it with steamed broccoli and sweet potato hash browns. I’ll be posting the sweet potato recipe next. This entry was posted in Poultry, Recipe and tagged boneless skinless chicken breast, chicken, garlic, grill recipe, lemon, paleo, recipe. I love this. 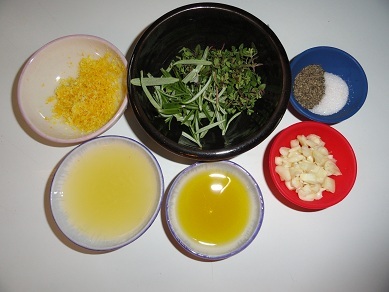 I cannot have vinegar, which knocks out most marinades. This sound terrific, and I will be trying it this weekend! Thanks for posting. Wow!!! That sounds great. I will have to try in the next couple of days. This sounds great I LOVE lemon and garlic. And shwarmas!!! I have been looking for years for an authentic lamb shwarma recipe. there are so many recipes put there. but, some how always fall short of the flavor of the gyros(shwarmas) I use to get at Uncle Nick’s a restaurant in Rockford,ILL. I haven’t had one in over adecade. I would love to be able to make those at home. any how Thanks for the recipe. I will be giving these a try. I tried this tonight on some thighs. We didn’t have time to soak overnight and it was still fantastic! I don’t usually comment on blogs, but I thought you should know we really enjoyed it! Thanks for sharing! This was very good! Today is my first day in the paleo diet, and this helped! Looking forward to the leftovers!